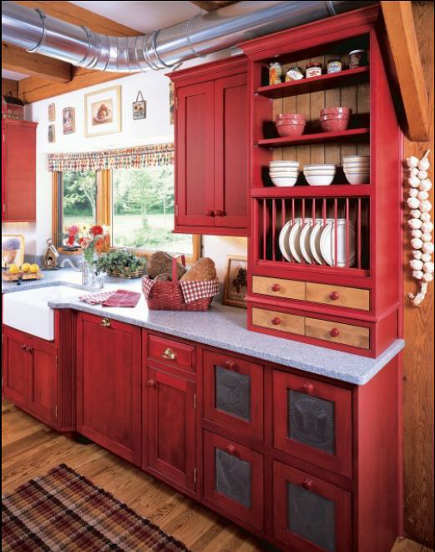 Red country kitchens are sometimes casual but always bold. There’s something about red kitchens that makes them a little difficult. People who love red tend use it as an accent color since a little can go a long way. We saw that with the refrigerator cabinet in the Ikea Heartthrob Kitchen, one of my original Atticmag posts, and also on the red workbench island in the recent Updating White Kitchens piece. 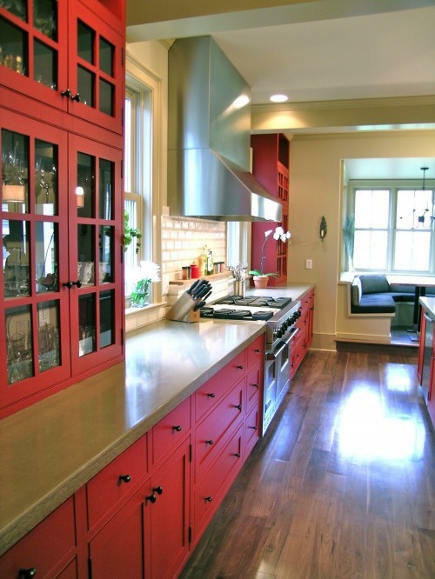 But my view is that a commitment to big color on the cabinets is usually the best option for red kitchens, which is what made the lacquered Chanticleer Red Kitchen so stunning and memorable. On the other hand, accent colors need to be carefully chosen. 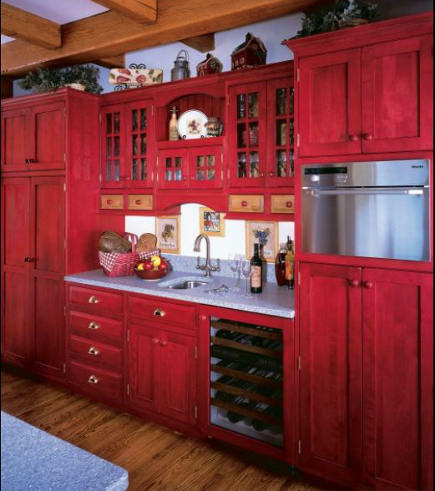 Red does have a soft side, which can be seen in red country kitchens where the finish on the cabinets is matte, and often muted. In a charming country kitchen [top], the cabinets have a gray undertone that almost gives them an antique milk-paint look. The matte finish looks great on simple shaker-style cabinet doors and feels practical for the row of apothecary drawers with scooped out pulls, but no handles. Those drawers will still look great when the wear starts to show. Painting the window trim behind to match the cabinets keeps the color integral and prevents the uppers from looking piecey. I also love the old-fashioned look of the big soapstone sink with its integrated backsplash. 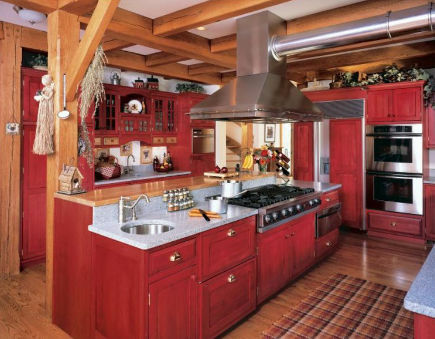 With white walls, the red is not overwhelming and keeping the workbench island natural pine is a smart choice. 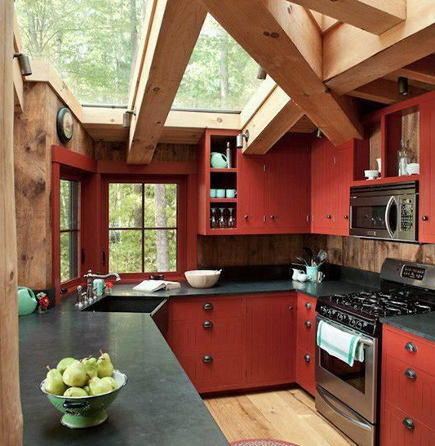 In a Maine cottage, another red cabinet-black soapstone kitchen is nearly upstaged by the incredible skylight ceiling that floods it with natural light. 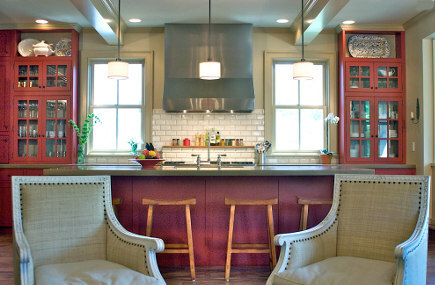 These red cabinets remind me of the weathered barn color that takes on a rusty undertone. And, again, they are matte, and the bead board fronts suggest primitive furniture. Black soapstone for the counters and custom farm sink is something of a tradition in New England kitchens. Oil-rubbed bronze cup pulls on the base cabinets are another vintage-y touch. Once again, natural pine mixes easily with the red and black scheme — on the walls, the ceiling beams and the wide-plank floor. On a cold winter morning with snow visible on the edges of the beams, this must be a very cheerful kitchen indeed. 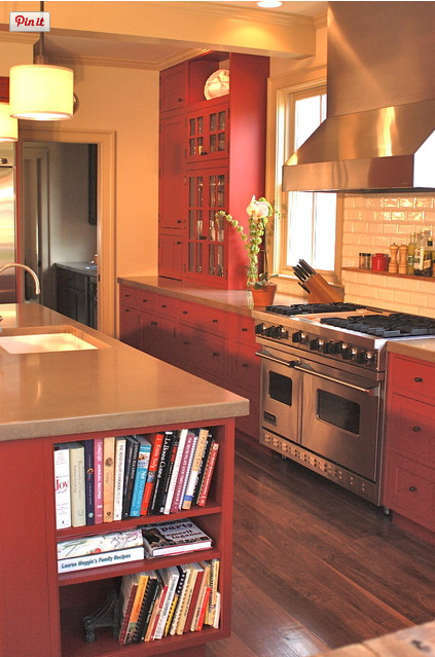 Another red country kitchen features painted cabinets with an antiqued look. And while I favor going all in on red, here it may be too much of a good thing. Once again, natural pine is a principal accent. But those light solid surface counters look so wrong! The rug drives me nuts, but not as much as all the tchotchkes on top of the cabinets. Dust bunnies anyone? Now kindly look over the island to the far wall. Then scroll down to the next picture. I would have loved to see these cabinets done in natural pine instead of the red. It would have been elegant and calmed down the “house is on fire” look of three walls surrounding a red island. The counters on the sink wall clash with the vintage styling of the chest-on chest cabinet with the plate racks and all the contrast drawers and cabinet back. This kitchen is a great color, has expensive cabinet detailing and a few unfortunate flaws that pull attention away from its strong points. 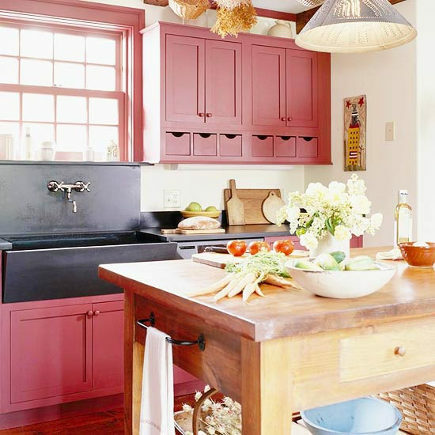 These red cabinets energize the range wall but are kept in check by the neutral concrete counters, the big stainless hood A stretch of creamy white tiles on the backsplash pulls away from the country feel but not too far. But with the island also done in the same hue, there is no shying away from the red, which feels warm but sophisticated in this liveable space. You had me at red! I am still considering painting some of mine red which was I wanted in the first place. I was afraid it might overwhelm the kitchen, which is not very large. I had to check these out just because of them being red. I love the skylights in that 2nd photo. Amazing!